Dinner is a 4 course meal - R300.00, and breakfast is R160.00 per person. To check availability or make a booking now, please click the "Book Online" button below. If you prefer, please contact us by email or use the form on the Reservations page. VAT @ 14% included. Due to new Government legislation there will be an additional 1% VAT charge added to your invoice on departure. This self-catering cottage has stunning views of the Mountains. We decided to do something different, and bring the Beach to the Bush. It comprises a queen sized bedroom, with en-suite bathroom. A huge deck for outdoor entertainment. Fully equipped kitchen with a Gas braai on the deck and a Built in Braai for outdoor cooking. Fan, electric blanket and heater. Snuggle under our percale cotton duvets and linen. (Note: If you are allergic to down feathers, we can supply fibre duvets and pillows). We supply charcoal. The unit is serviced daily. Clay pigeon shooting, Spa treatments, the 'Bush bath' can all be booked during your stay. You are welcome to book any activity and or meal at the lodge. This room falls under our 4 star grading. This cosy rustic wooden cottage is situated 1/2km away from the main lodge area next to the indigenous forest and is totally private, and within earshot of the stream, with stunning views of the mountains. The cottage has a fireplace in the lounge/ dining room and is fully equipped. There is a large outside braai area, with a table for a lazy breakfast, lunch or supper. The cottage comprises 1 queen bedroom en-suite (bath and toilet, with the shower over the bath), another small bedroom with bunk beds and a double sleeper couch in the lounge. Suitable for couples with children or a romantic getaway as the bathroom is open-plan romantic style. Fan, Electric blanket and heater, snuggle under our percale cotton duvets and linen. (Note: if you are allergic to down feathers, we can supply fiber duvets and pillows) We supply Fire wood. Please note that while we have not had the Forest Cottage graded - and it thus does not fall under our 4 star grading - you can still expect the same welcoming Forest Creek atmosphere. An additional R100.00 per night, per person above 2 guests. 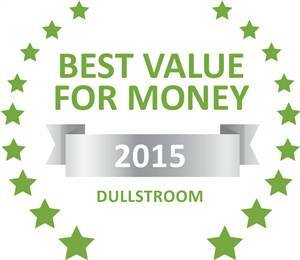 Based on reviews of establishments, Bee Eater Self Catering Unit has been voted Best Value for Money in Dullstroom for 2015. This Self-catering unit is the ultimate in luxury and out-door living; it supports a Braai, Fridge, Microwave oven, gas 2 plate stove, and is fully equipped, has a fireplace, DSTV, his and her outdoor stone shower, veranda, it's own private garden, huge bath tub for two with lots of romantic candles, King sized extra length bed. Fan, Electric blanket Bar fridge and heater, snuggle under our percale cotton duvets and linen. (Note: if you are allergic to down feathers, we can supply fiber duvets and pillows) We supply Fire wood and charcoal. This self catering unit has two bedrooms; 1 bedroom with a queen sized bed en-suite bathroom, the other bedroom has a King sized bed, or can be converted to 2 x single beds. Additional beds can be ordered for small children. Also has an en-suite bathroom. Fully equipped kitchen with a gas Braai and Webber braai for outdoor cooking. Fan, electric blanket and heater; snuggle under our percale cotton duvets and linen. (Note: if you are allergic to down feathers, we can supply fiber duvets and pillows) We supply Fire wood and charcoal. Meals can be booked at the lodge.